With our very own chic design, the ‘Gisele’ teapot that will transform the way you enjoy tea. 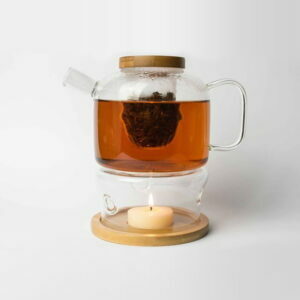 Elegant and timeless, it has hand blown borosilacate glass with bamboo finishing, and its design infuses the tea slowly for a sweeter and smoother cup. A special element in its functionality is the ability to keep the tea warm with a tea light candle beneath, perfect for entertaining.